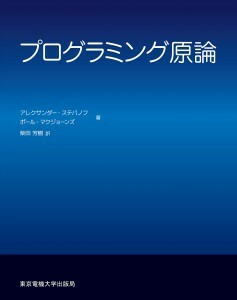 The original Japanese translation of Elements of Programming went out of print. But Yoshiki Shibata, the translator, proposed to Tokyo Denki University Press that they publish a new edition, and they agreed. It is available via Amazon.jp, and joins the English, Russian, Chinese, and Korean editions. We are very grateful to our publisher and our translator Yoshiki Shibata for this opportunity to address our Japanese readers. This book is in the spirit of Japanese esthetics: it tries to say as much as possible in as few words as necessary. We could not reduce it to 17 sounds like a traditional haiku, but we were inspired with its minimalist approach. The book does not have much fat. We actually hope that it does not have any fat at all. We tried to make every word to matter. We grew up when Japanese engineering was beginning to revolutionize the world with cars that did not break and television sets that never needed repairs. Our hope is that our approach to software will enable programmers to produce artifacts as solid as those products. Japanese engineers changed the experience of consumers from needing to know about cars, or, at least, knowing a good mechanic, to assuming that the vehicle always runs. We hope that the software industry will become as predictable as the automotive industry and software will be produced by competent engineers and not by inspired artist-programmers. Our book is just a starting point; most work to industrialize software development is in the future. We hope that readers of this book will bring this future closer to reality. We would like to thank Yoshiki Shibata not only for his very careful translation, but also for finding several mistakes in the original.